Friday is quiz day! Right? In elementary school, quizzes came on Fridays. Math quizzes: to be taken only in pencil. Spanish quizzes: filled out while kneeling on the floor and using our plastic chairs as desks. (Wait, what? Come to think of it, I guess they couldn't afford desks for all the rooms.) Spelling quizzes: at least one of my teachers had me sit in the back of the room and grade everyone else's spelling tests. That's a good way not to make friends, let me tell you. Spelling quizzes, at least, must be out of fashion these days, judging by the letter I just read from a 12-year-old who spelled "door" D-O-R-R. Anyway, in honor of Friday, and since the latest effort to slow down that oil gushing into the ocean might have worked (! ), I wrote you a quiz. 1. Which of the following does NOT describe an attempted method of oil-spill control? 2. What is the best way to clean an oily seabird? 3. Of the five sea turtle species that live in the Gulf of Mexico, how many are endangered? 4. 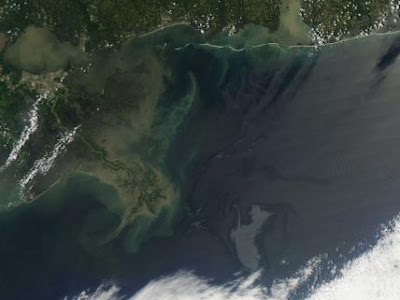 Which of the following has NASA, watching from above, NOT used to describe the changing shape of the oil slick?